I received my Bill Tracker Journal a few weeks ago and plan to have all filled out for this month by the end of the week. These are AMAZING! Right now you can get one for $12.99 (Retail $30). 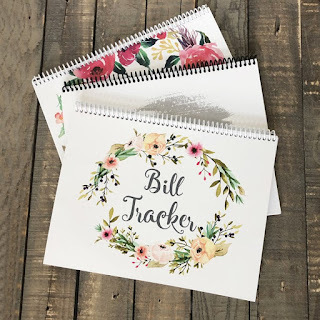 New Personalized Bill Tracker Journals! These 12-month journals are perfect for anyone! (each undated "month" has a: undated calendar, 2 payments pages, and 1 notes page) - you fill in the dates! •+ extra pages with yearly bills, accounts pages, and subscription pages. + extra pages for notes. $3.99 for the first item and $1.99 for each additional item. US only. Ships no later than Sat, Apr 21.